Shifting the conflict experienced by the Main Character into a different area creates a unique kind of story. Crafting a story that examines conflict from a different angle challenges the expectations of an Audience familiar with the same old thing. While some prefer to see the templates of commonality within story, the real key to unique storytelling lies in understanding the power of perspective. 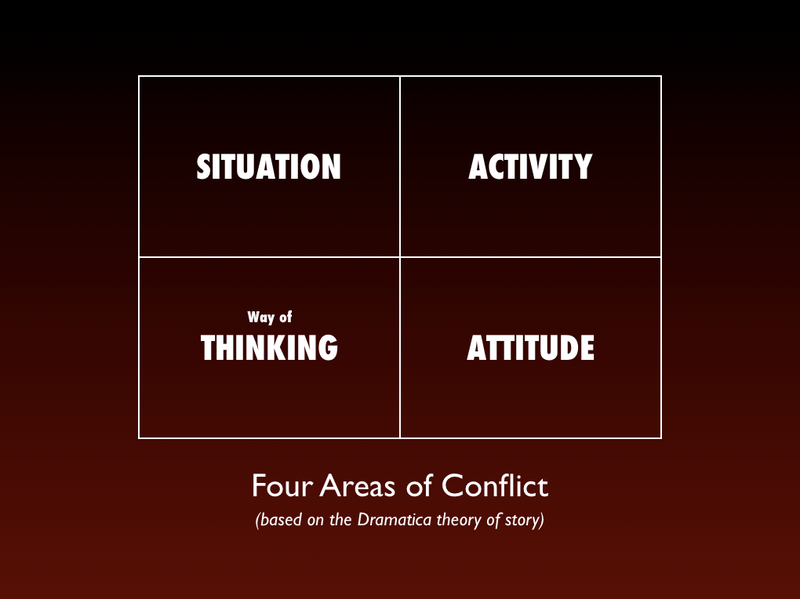 The last two articles in this series on Conflict introduced the idea of the Four Throughlines and the Four Major Areas of Conflict. By attaching a Throughline (or perspective) to one of these areas, an Author sets up the personality of the story. The article Familiar Patterns of Story Structure covered the prevailing structural arrangement, or personality, found in most American films. Why do Star Wars, The Matrix, Die Hard, How to Train Your Dragon and Avatar seem familiar? Beyond beat sheets and mythical stages, these films focus their storytelling on the same kind of conflict. This similarity guides them into the same structural Genre. The Main Character finds themselves personally faced with a Problematic Situation. The Influence Character by his or her Fixed Attitude. The Relationship between the two revolves around their Problematic Ways of Thinking and the Overall Story examines Problematic Activities as a whole. But what would happen if we simply flipped the Main Character and Influence Character positions? Would it feel any different than the films listed above? The Overall Story Throughline would still lie in Activity so it shouldn’t make a difference, right?. There would still be the usual kicking, stealing, fighting, grabbing and killing. But what if the Main Character was suddenly facing a problem of Attitude rather than a problem of Situation like their status in life or physicality? What would that film feel like? For starters, you might end up with this 1942 classic that many consider one of the best films of the 20th century. Like Star Wars, The Matrix, Avatar and Kung Fu Panda, Casablanca focuses its Overall Story Throughline on Problematic Activities. How else would one categorize the problems found in hiding stolen exit visas and escaping the clutches of evil Nazis? 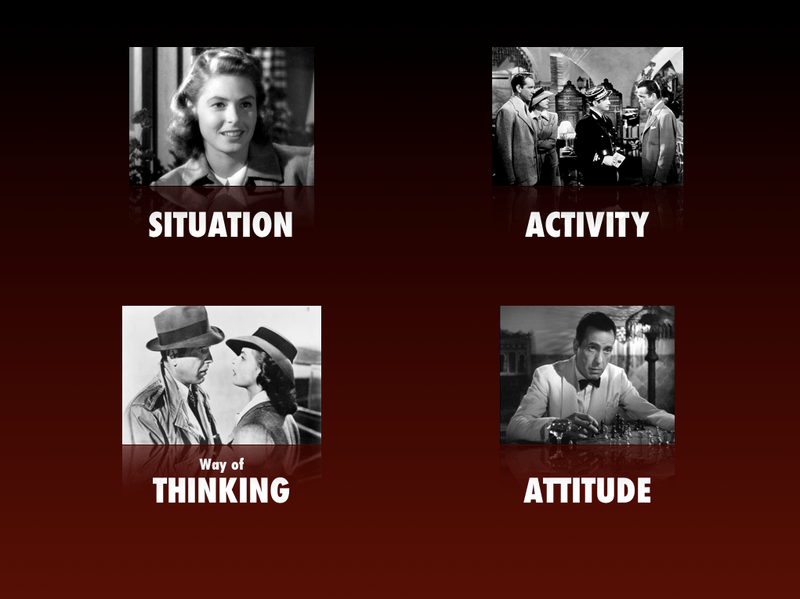 And like most action films, both the Main Character and Influence Character in Casablanca find themselves in a battle over how each other thinks (Problematic Ways of Thinking). If only Ilsa could convince Rick to change his mind about her and about those visas, perhaps things could work out for them. And this gives us a bit of a clue as to why Rick’s Throughline fits better in Fixed Attitude rather than the Situational area of conflict. Rick has no problem with the way he looks, with where he is living, or his status within Casablanca. What Rick does have though is a very bad, very sour attitude. “I stick my neck out for no one,” tells of a rather opinionated Main Character. Most importantly though, is that this opinion creates major problems for him. It is where he will have to do the most growing as a character. What about Ilsa as a Situation Influence Character? Besides being the most beautiful woman in the world (which certainly has an impact on poor Rick! ), Ilsa’s status as the wife of a selfless freedom fighter gives Rick’s bad attitude a moment of pause. How can he keep this facade up when this person stuck in an untenable position is willing to give of herself for others? As you can see, this structural setup has a slightly different personality from the films covered in the last article. Instead of focusing on all the problems Rick creates because of what he is doing (like Luke or Po), the emphasis here lies in what Rick is not doing. Getting Rick to stick his neck out? That’s what the whole story tries to prove is a good thing. 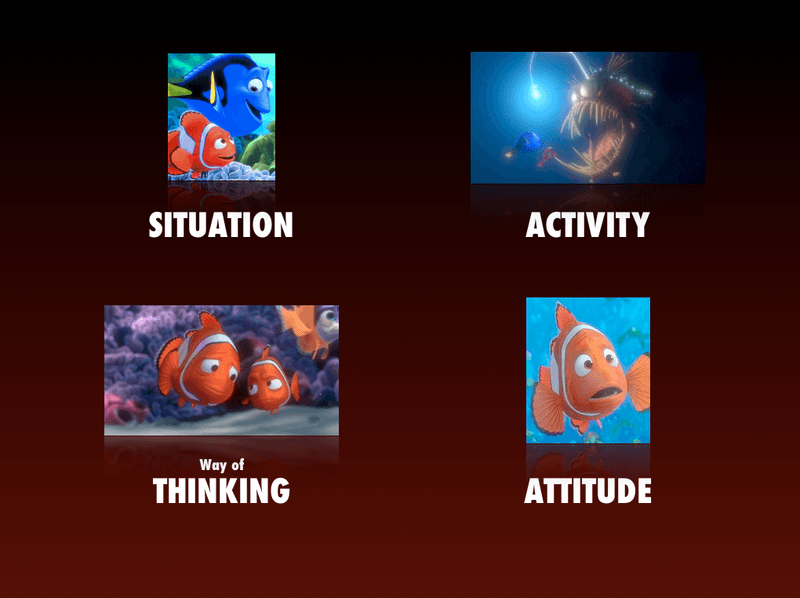 And that same dynamic, that same cause for growth in Rick, orbits around Marlin in Pixar’s Finding Nemo. Like the saloon owner in Northern Africa, father Marlin struggles with a strict mindset: he knows what his son can and cannot do. The constant worrying and obsessing over safety? That’s a Fixed Attitude that creates problems personally for him and for those around him. Like Rick, it is not so much what Marlin is doing that is causing him grief, but rather what he won’t open himself up to. Give that little guy some distance and look what he can do. This is how rigid opinions change their course in stories of adventure. There is nothing wrong with the familiar Situational Main Character, but as you can see, a different kind of story exists where the central character finds themselves at the mercy of an opinion. 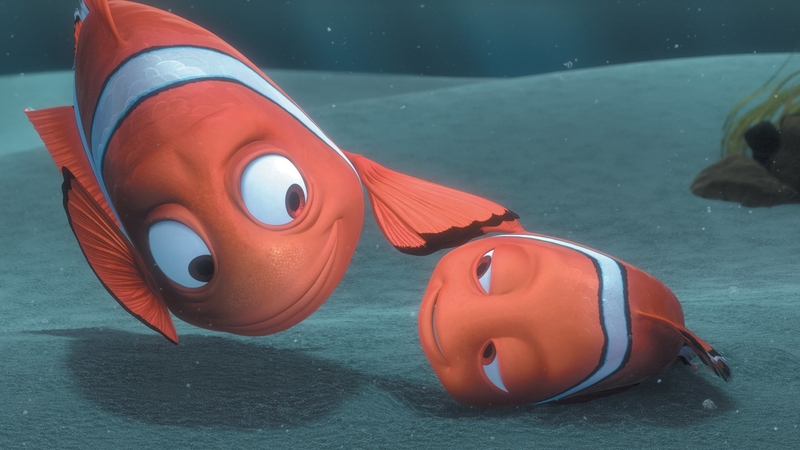 Finding Nemo and Casablanca aren’t exactly bargain-bin disasters; they’re both masterworks of storytelling that will continue to prevail long after we’re all gone. Authors have the ability to sway opinions, to shift the attitudes of an Audience simply by the juxtaposition of perspective and problem. By providing them something not-so familiar, the knowledgeable writer engages their senses of delight and surprise. Tack on a meaningful argument, something important you want to say with your words, and the Audience will assume that message with ease and wonderment. Dramatica refers to this important structural concept as the Main Character Growth and gives two choices: Stop or Start. With the Throughlines arranged as above, the Growth is Start. Arranged in the familiar Western culture alignment (found in the last article), the Growth is Stop. These films tell stories of Main Characters who need to Stop what it is they are doing (Stop testing yourself all the time, Luke, and Neo, stop thinking so little of yourself). Instead of a hole in their heart, these Main Characters appear as having a chip on their shoulder. Again, this reality of story structure occurs naturally because of where the Author chooses to focus their perspectives (throughlines) in a story.